Making the correct number of cilia is critical: most cells have a single cilium for signaling, tumor cells have no or extra cilia, and, uniquely, multiciliated cells need hundreds of cilia. Cilia are made up of the axoneme that emanates from the basal body or centriole. Multiciliated cells generate hundreds of centrioles, which traffic to and dock with the cell surface to elongate the axoneme. We used mice and primary airway epithelial cell culture to study how cells adopt the multiciliated cells fate and undergo ciliogenesis to understand the mechanisms of cilium number control and the pathway itself, which could enable future cell-based treatment of multiciliated cell defects in airway disease. 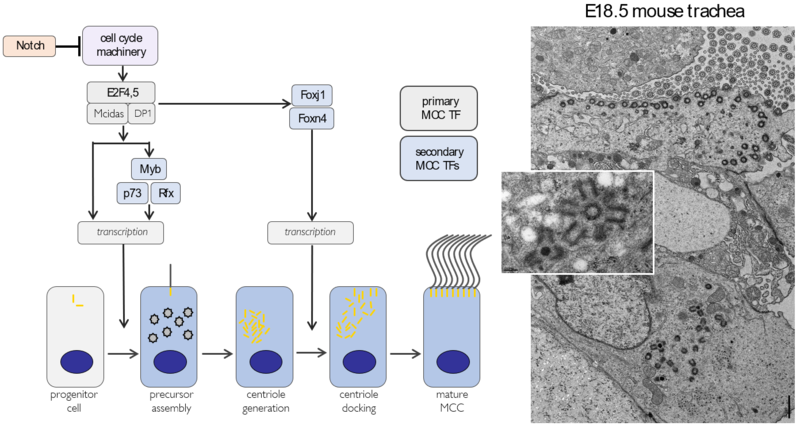 As a result, two critical factors for the multiciliated cell fate decision and the generation of many motile cilia are emerging: a specialized cell cycle state and a multiciliated cell-specific transcriptional network.